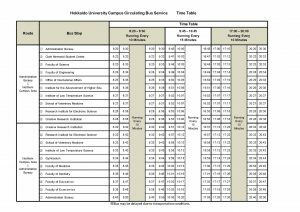 With the Sapporo Campus being as large as it is, a free campus shuttle service operates during the semester from Monday to Friday (excluding public holidays). The route begins on the western facade of the Administration Building, passing through the main spine of the campus and extends to the Northern Campus area before coming back on the same route. The bus welcomes international visitors on official visits to the university and is also used by university staff wanting to get from A to B. Students are not permitted to use the shuttle bus unless they are injured or feeling unwell. Due to capacity issues, tourists are also asked to refrain from using the service. For safety reasons, standing on the bus is not permitted. To find out the locations where the bus stops, please refer to our online map and click “Shuttle Bus Stops” from the menu located on the right hand-side of the screen.